objectives and purpose as a nonprofit volunteer organization. 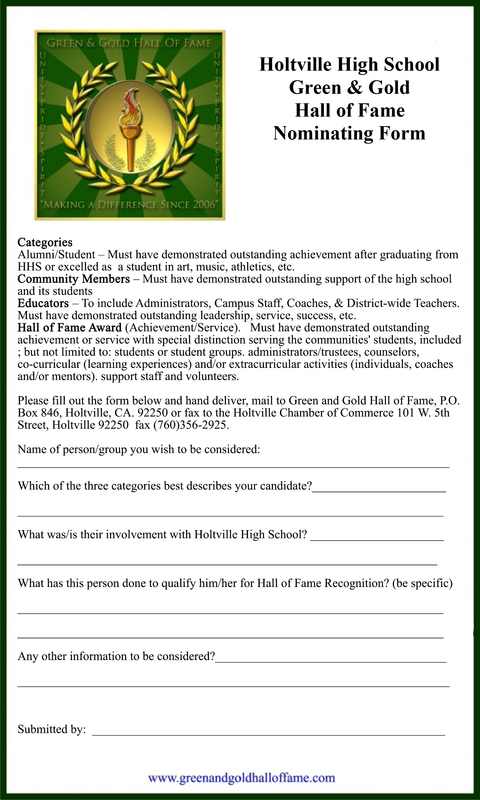 Holtville Unified School District and the Hall of Fame Committee. 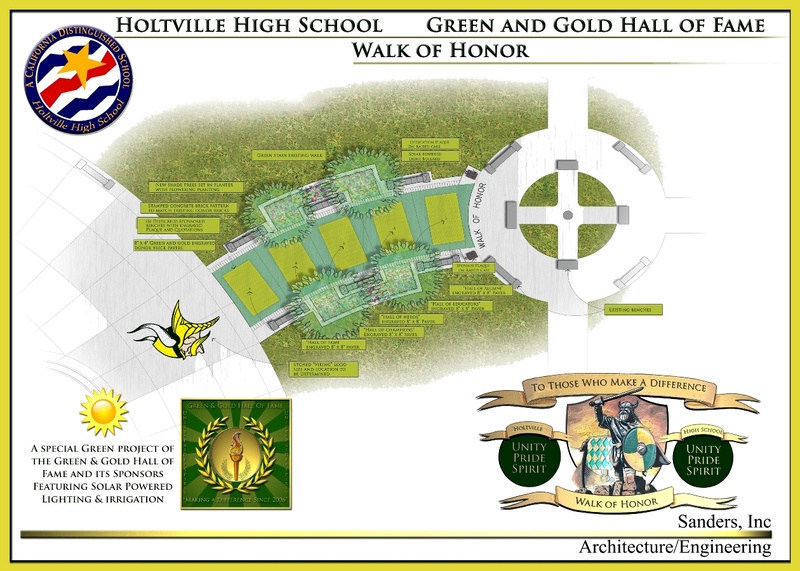 the Viking Spirit Courtyard and the Alumni Walk of Honor. year each the Hall of Fame member was inducted; and all scholarship/educator stipends are named on a separate plaque. Ongoing project to recognize alumni Authors, Designers, Musicians and Artists. Purchased display board, books and artwork, and have had alumni provide biographies. All on display in the Library and district board room. commemorative watches and/or embroidered valuable bags. THE HALL OF FAME IS NOW SPONSORING THE HOLTVILLE HIGH SCHOOL ANNUAL CAREER DAY: “PURPOSE IS THE REASON FOR YOUR JOURNEY, PASSION IS THE FIRE THAT LIGHTS YOUR WAY”. On behalf of the Vencill family, Imperial Valley Pioneers, graduates and benefactors of HHS, a permanent endowment has been established for the Howard and jewel Vencill Nursing Scholarship that will be administered by the Green and Gold Hall of Fame Committee. The annual five-year Nursing scholarship to IVC/SDSU is to be used for HHS graduation student (male or female) entering the field of nursing. Student leaders and advisor attend the California Association of Student Councils summer leadership conference. School leaders will now have the opportunity to acquire a variety of leadership skills and team building techniques. Honor are complete and are displayed as orders are received. sponsored by the Hall of Fame. “Championship ring” representing their sport.